We all aspire to reduce harmful elements from our daily lives. Looking past clever marketing ploys and a lack of information on the full facts, it can be hard to make informed choices for ourselves, our family and our homes. But, to cover a wide range of topics, we would have to read extensively to form our own opinions. 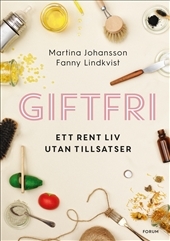 So why not let two Swedish experts, Martina Johansson and Fanny Lindkvist, do it for you? Drawing on their extensive research and personal tried & tested methods, civil engineer and biohacker Johansson and nutritionist and photographer Lindkvist offer up their invaluable information and practical, accessible tips on removing harmful materials and substances from your lifestyle in a world where we are surrounded by environmental pollutants and irritants and we are waking up to the realisation of plastics polluting our waterways. Driven by their natural desire to understand how things work (Martina) and finding sustainable, healthy options (Fanny) following a stint living in China (Martina) and family allergies and health problems (Fanny), the two have collaborated on an indispensable guide to give readers the knowledge and tools to make practical improvements to their lives and health with the healthy credo that it’s ok to slip up at times (the “never minds”) – we’re human after all! Offering up solutions that are ecological, sustainable and toxin-free, the book takes you on a journey through the multitude of domestic areas: the bedroom, bathroom, kitchen, garden, food, household waste, haircare, beauty, natural health, clothing, travel, pet care.